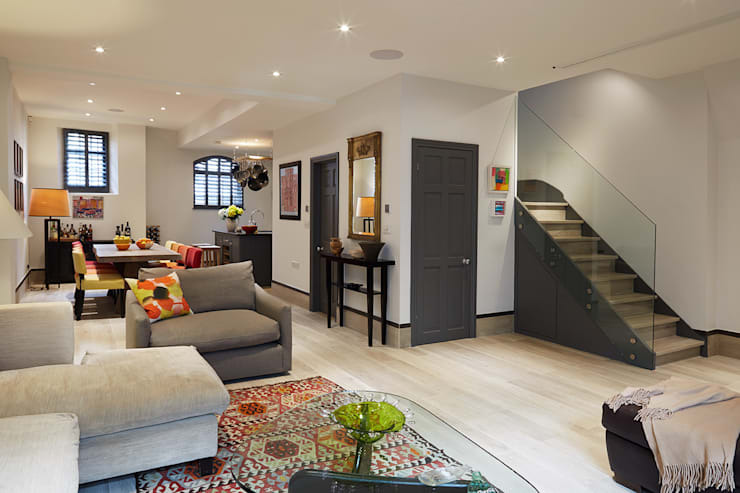 Today we will explore the refurbishment of a British mews house. For those who aren't aware, mews is a British term to describe a row of horse stables in London. These were built to back onto, and serve grand 17th, 18th and 19th-century homes. They usually form small laneways or cul-de-sacs with an intimate, old-world community feel. When motorcars were introduced during the early 20th century, many of these lovely buildings were abandoned. But in recent years, they have come to be recognised for their historical significance. In property hungry central London, many have been converted into upscale, residential housing. Mews properties were built for practicality, not luxury. So like most of these properties, the mews home conversion we will explore today, had limited light. It also had linking floors and staircases that gobbled up precious floor space. Interior Architects Reis London took on the project and completely restructured the interior. Come with us on a photo tour to explore the vibrant result! 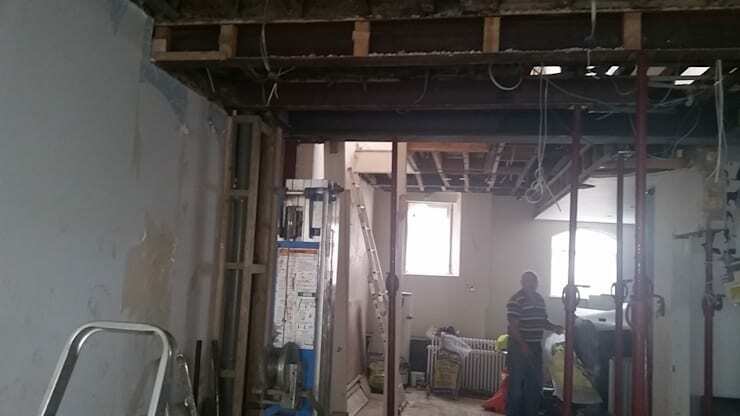 Most of the interior walls were removed and the entire place was almost gutted. This helped remove any traces of the old pokey and dark feel to the place. Note the garage area on the right. 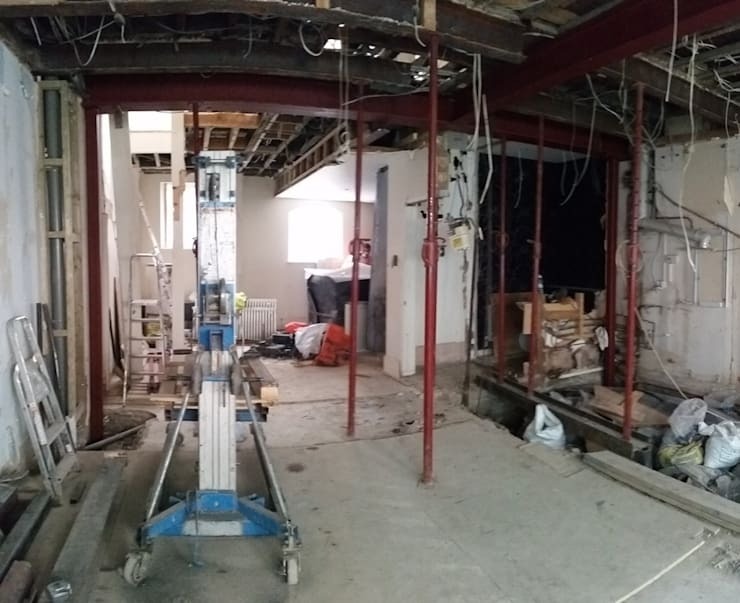 This was to be turned into a central connecting area of the home. It's an area that receives very little natural light. This transformed space is located at 180 degrees to the last picture we explore. The complete overhaul of the basic structure has been finished with pale cream walls, recessed light fittings and clever furnishings. The unbroken lines and curves allow the eye to move smoothly around the room, increasing the sense of spaciousness. 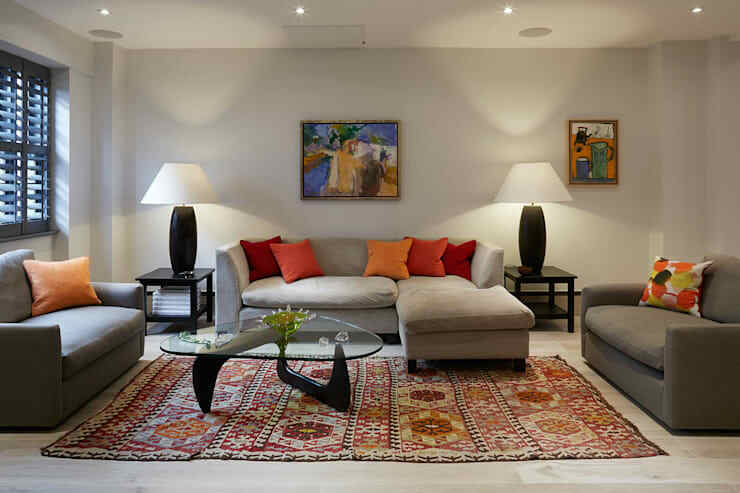 The oversized proportions of the lampshades also contribute to this effect. In this image, the lower level has now been fitted with the beginnings of a connecting staircase. Yet, despite the progress, the place still exhibits damaged walls and pokey, drab feel. The original, heritage facade could not be radically changed and the challenges of the project are clear. The open-plan living room and kitchen now have a lovely, contemporary English ambience. The all-important contemporary sense of spaciousness has been created with pale timber floors, white walls, and a partial glass staircase. The transformation feels natural because the designers have used a careful balance of old and new. The original style heritage windows and doors have been highlighted with a traditional, period blue paint. This contrasts nicely with the white walls and subtle, vibrant furnishings. The cavernous space was completely gutted and waiting to be filled with warmth and life! The original historical windows are missing and the entire space is still held together with construction support. The room has a decaying, abandoned feel. The open plan kitchen-dining area is now filled with vibrant warmth. 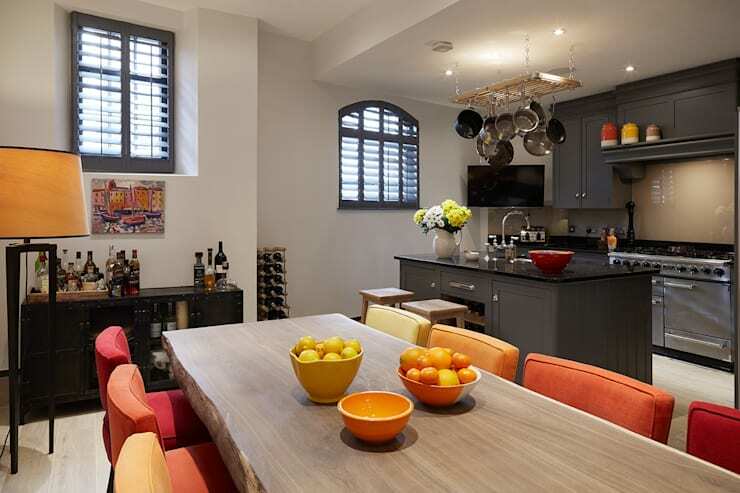 Bright warm dining chairs in varying tones and a lot of fresh zest to the ambience. At the same time, there are strong links to the past. The rustic wooden dining table and classic period style kitchen do justice to the history of the dwelling. We hope you enjoyed the tour! If you're interested in radical renovations, you'll love the Amazing Transformation of a Mexican Loft. What do you think of the dramatic transformation of these horse stables? We'd love to hear in the comments field below!